East Boldre Parish is one of the most unusual Parishes in the New Forest with one main road running from Hatchet Pond to East End, some two and a half miles. Almost all of the properties in Main Road were built on one side of the road outside the Manor Boundary, on encroached land. All of these roadside properties front onto the open forest and many were originally claimed under ’squatters rights’ where a family would take a plot of Crown Land and build four walls, roof and chimney and get a fire burning within 24 hours. There are also several roads running off at right angles to Main Road where there are small estates such as Sweynes Lease and Strawberry Fields. 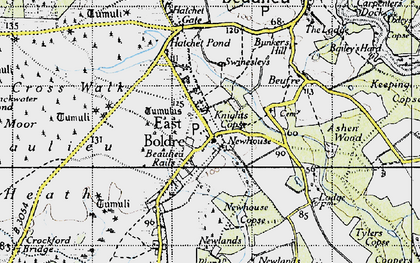 There are no really large houses in East Boldre with the exception of Hatchet Mill which is believed to have been built in the 18th Century. The building had become almost derelict but was rescued and restored by the present owners.